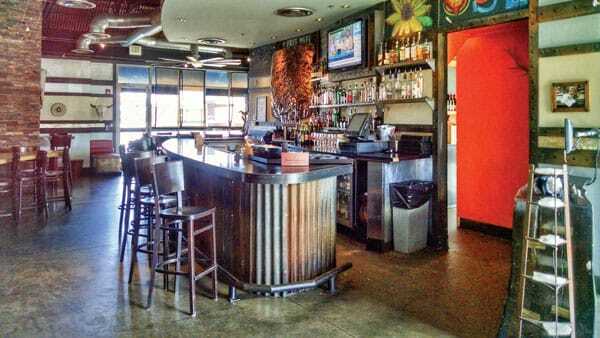 A bit of nostalgic history connects Taos, New Mexico to a sophisticated, yet rustic restaurant in Highlands Ranch that captures the diverse richness of Tex-Mex inspired cuisine and bears the name Old Blinking Light (OBL). Taos is a scenic destination nestled in the Sangre de Cristo Mountains where people go to ski, learn about ancient Pueblo cultures, and taste the flavors found only in southwestern cooking. In times past, Taos’ “landmark” traffic light that once guided patrons to a quaint dining establishment just one block away later became the namesake for the restaurant. Today, the Colorado night sky still illuminates the familiar “old blinking light” in Highlands Ranch. Restaurant owners Michael Nachino, Nat Troy, Earl Gonzales and Mikial Roig have succeeded in putting together a montage of unique flavors that come from the fusion of American and Mexican cuisine. 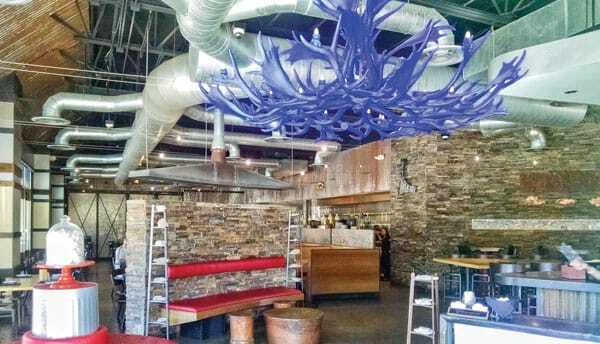 “It has definitely been a collaborative effort to create our menu,” noted Roig, assistant general manager and co-owner. Finally, I was able to narrow down my choices to New Mexico posole, chicken enchiladas, or Baja fish tacos. It came down to, “what will I take home and enjoy again later?” The enchiladas were my clear winner. I persuaded the other part of my party to order the pan-seared fish tacos and we decided on a kid’s rice and beans plate for the charming half-size person at the table. At last glance, we ordered the Brussels sprouts appetizer to start us off. Conversation and a coloring-sheet made the time pass smoothly as our waitress Esperanza made sure to keep our iced teas filled to the brim. They also had these fun, copper mini-tables that looked like bongo drums – but thankfully sounded quieter – that served to entertain our pint-sized musician. It was a steady but not busy lunch, so our Brussels sprouts came out of the kitchen in a flash; probably due to the fact that they were peeled apart and flash fried. What arrived was a presentation cooked with red and Peppadew peppers and a balsamic drizzle. 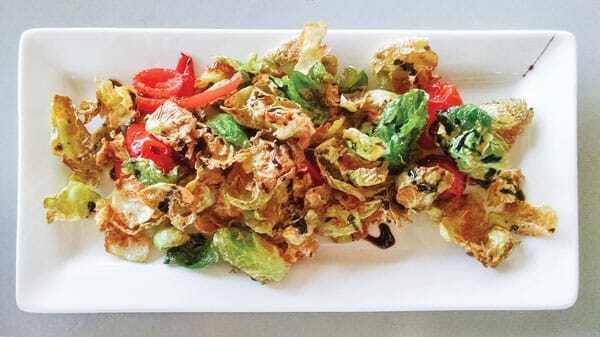 Think Brussels sprout chips, with a sweet and tangy finish from the peppers and taste of the dressing. The enchiladas arrived decorated like Christmas; the code word for half red and half green sauce. They came piled high with guacamole, sour cream, lettuce and pico de gallo. Though I had eaten more than my fair share of delicious sprouts (which we later found out were flash-fried in duck fat), I dove into the slightly crispy chicken enchiladas, which featured a red and green sauce finished with a hint of spice, garlic and onion flavor. Pan-seared fish tacos were delivered across the table. 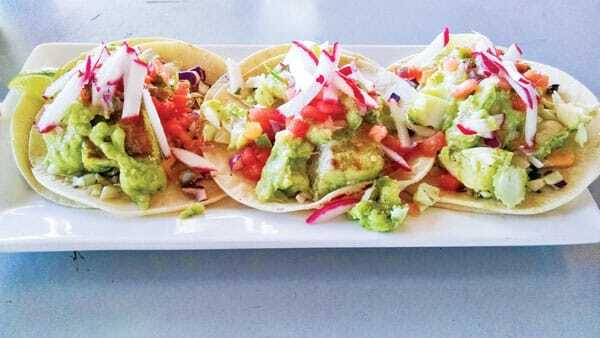 The three tacos came on corn tortillas, piled generously with seared cod, guacamole, lettuce, pico de gallo, and a slice of lime. The tastiest part of the shared taco dish was the thinly sliced, fresh radishes that garnished the top. Crunchy, creative and tasty. “We pay extra to make sure we keep fresh produce stocked that is mostly organic and antibiotic free,” added Roig. It was pleasing to see that the kid’s rice and beans plate looked about as pretty as you can make a plate of rice and beans look. Instead of the usual avocado it comes with, tomatoes were substituted, which we thought added a pleasing color to the dish. Our picky eater devoured the plate’s contents; hence we concluded that the meal was satisfying. OBL has put together a menu of American and Mexican influenced southern hospitality. It is a place that accommodates all ages and palates (along with some savory gluten free edibles). Although we didn’t explore alcoholic options on this visit, OBL has a full bar that fills wine glasses with selections from California, Italy and Argentina. Not only will the service and atmosphere keep patrons returning, but the variety of the hearty Tex-Mex fare portions on the seasonal menu should keep the doors open for years to come. 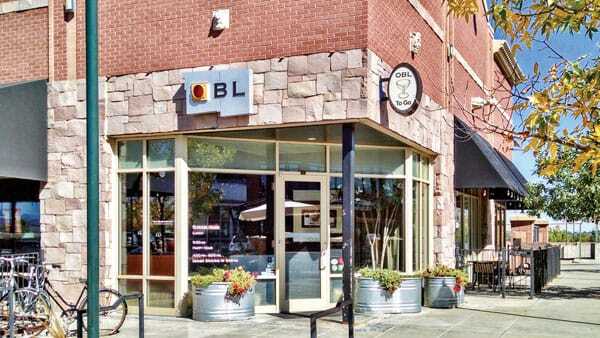 The OBL is located in the Highlands Ranch Town Center at 9344 Dorchester Street. The restaurant is open for brunch on Sundays (and soon to be Saturdays) from 11:30 a.m. to 3:00 p.m.; lunch everyday from 11:30 a.m. to 4:00 p.m.; happy hour Monday through Saturday from 4 p.m. to 6 p.m.; dinner Monday through Thursday 5 p.m. to 9 p.m., Friday and Saturday from 5 p.m. to 10 p.m., and Sunday from 5 p.m. to 8 p.m. Call 303-346-9797 for more information or visit www.oldblinkinglight.com.